Still have time to start tomatoes from seed! Happy Fourth! Celebrate with summer vegetables! Corn on the cob! Watermelon! Great Aunt Matilda has outdone herself this year with an entire casserole of dip, striped with red tomatoes and white cucumbers, a rectangle of blue corn chips in the corner to eat it with. If you missed planting tomatoes and corn this Spring, you still have time! A whole new list of possibilities await if you are tired of the tomatoes and corn! Look up the average date of the last frost in your area. In most of the places I've lived, it's been around Halloween. After spending all the time and planning to look AWESOME and SCARY or BEAUTIFUL, it's cold on Halloween. Slap a winter coat over all your glory and hope you have a good mask. Pumpkins! This is a 90 day crop. A lot of the winter squashes and gourds have long growing seasons, so if you love mush, carpe diem! When to plant vegetables isn't always clear, especially with the less common vegetables. Starting now, you will remember forever when to plant pumpkins, acorn and other hard squash! Plant pumpkins on July 4th. They will be ready for Halloween and then Thanksgiving! 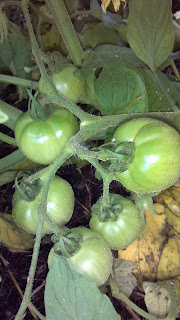 Tomatoes: Most tomatoes take about 70 days to produce. Cherry tomatoes take less. Still plenty of time for tomatoes! Plant them deeply and water them regularly! Corn: With a harvest time of around 75 days, you can ensure a crop of naturally grown corn when you grow your own! Cucumbers: No problem! 50-65 days to maturity. Plant a few seeds each week for the next month. As one batch is giving up, the next will be ready. Peppers: Now is the time! They set more fruit in cooler weather, and it will be here just in time! Two and a half months until bloom, so hop to it! After the time to plant summer vegetables has passed, there are a TON of crunchy, cool-weather vegetables to plant. Some, like potatoes, prefer cool weather but no frost. Others, like spinach will grow through snow! You haven't missed that season either!